The Go Bowling 250 at Richmond (Va.) Raceway will be the first race of 2018 NASCAR Xfinity Series Playoffs. The playoffs begin with 12 eligible drivers and are divided into three rounds with the first two rounds consisting of three races apiece and a final, single-race round at the Homestead-Miami Speedway season finale. Four drivers are eliminated after each of the first two rounds to ultimately establish four finalists at Homestead. Drivers automatically qualify for the next round with a win in the current round with the remaining spots determined by the point standings. At Homestead, the top-finishing driver among the four finalists wins the championship. Custer will begin the 2018 Xfinity Series playoffs from the fourth seed with 2,011 points, 28 behind leader Justin Allgaier. Custer is no stranger to victory lane at Richmond. In 2014, he took the checkered flag after leading 52 laps in the K&N Pro Series East race. In Custer’s five combined starts at Richmond in the NASCAR K&N Pro Series East (two races) and NASCAR Xfinity Series (three races), he has a win, two top-five finishes, three top-10s and 76 laps led. In 64 career Xfinity Series starts, 42 Camping World Truck Series starts and 29 K&N Pro Series starts since 2015, Custer has five wins, seven poles, 16 top-five finishes, 32 top-10s and 1,077 laps led at tracks that are a mile in length or shorter. Custer’s second-place finishes May 26 at Charlotte (N.C.) Motor Speedway and Sept. 1 at Darlington (S.C.) Raceway are his best in 26 races this season. Custer’s average starting position of 6.2 and five pole awards in the 2018 Xfinity Series season lead all Xfinity Series regulars. He has earned 19 top-five starts and 24 top-10 starts this season. Custer’s 21 top-10 finishes is tied with Elliott Sadler and Allgaier for most among Xfinity Series regulars. Custer has also earned 11 top-five finishes and has led 240 laps this season. 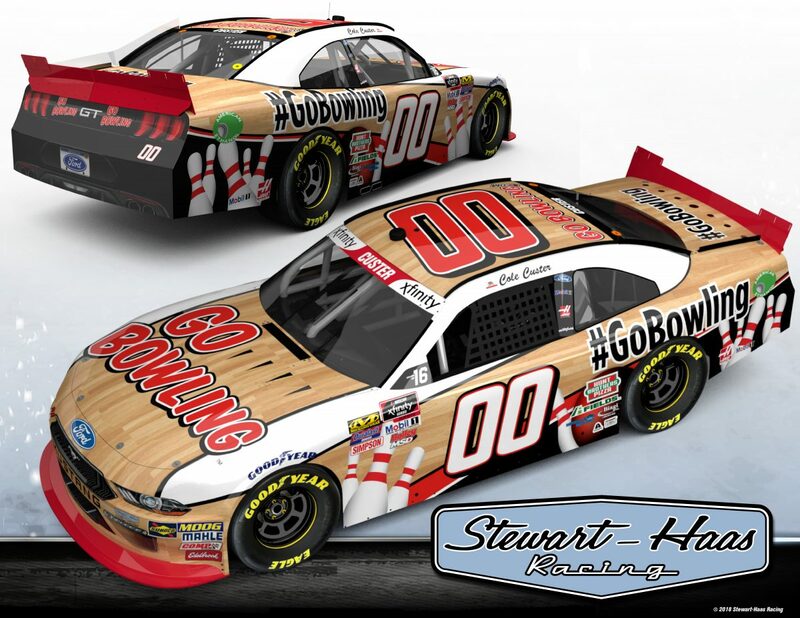 Go Bowling will serve as the primary sponsor of the No. 00 Ford Mustang at Richmond for the first time this season. comis the go-to site for consumers to learn more about the sport of bowling, including information about the more than 1,700 bowling centers around the country. The site helps fans find local bowling centers, promotional offers, video bowling tips and other bowling information. To learn more about Go Bowling, visit GoBowling.com. Custer will attend Wednesday’s Professional Women’s Bowling Association (PWBA) Tour Championship in Richmond’s historic Old Dominion Building. The event will be televised live by CBS Sports Network. In Custer’s most recent start at Richmond April 20, he earned his fifth pole award of the season and led the first 43 laps of Stage 1. He raced in and around the top-five until the team was handed a penalty on pit road for an uncontrolled tire. He started the final stage from the rear and rallied the No. 00 Ford to a sixth-place finish. Custer will pull a double-duty weekend by making his third career Monster Energy NASCAR Cup Series start in Saturday night’s Federated Auto Parts 400 at Richmond. This is your second straight appearance in the NASCAR Xfinity Series playoffs. Is your mindset different than last year, when the Go Bowling Ford team started from scratch? Richmond is a unique track. What does it take to get around the .75-mile track faster than anyone else? What have you learned from Richmond and what will it take to make it to the next round of the playoffs?